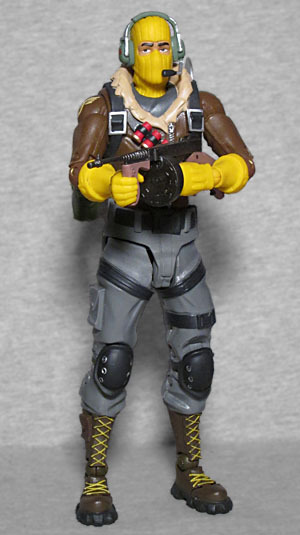 Somebody finally makes large-scale GI Joe figures, and they choose to start with Tiger Force Beachhead? The Fortnite Cuddle Team Leader was an amazingly fun figure, so good that she actually helped earn McFarlane some nominations in the Toy of the Year awards, both for her by herself and for the line as a whole. (They didn't win, because competition was stiff, but when was the last time you heard anyone call McToys "best" at anything?) Anyway, the Cuddle Team Leader was released a bit ahead of the rest of her series, but the other three figures did follow soon after, which is why we can today review this Royale Air Force test pilot. 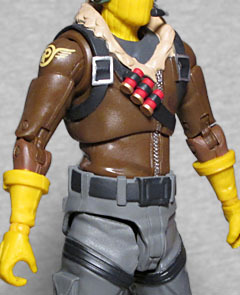 Raptor's colorscheme is brown and yellow, like some second-tier college sports team. The only bit of skin we can see is right around his eyes, because he wears a full-head ski mask that's even been tucked into his shirt - he takes his facial warmth seriously! He's wearing a pair of green headphones with a microphone, presumably so he can communicate with his team. Below the neck, he definitely dresses like a military test pilot, with a fleece-lined leather bomber jacket, grey pants with black straps and kneepads, and thick shin-high boots. There are grenades on his belt and shotgun shells around his chest. The shape of the body and the level of detail in the sculpt definitely mark this as coming from a cartoonish property - he's more "Pixar" than "Private Ryan." Everything is big and chunky, with very few small details to be found anywhere. It all holds together as a cohesive look, but if you do try to form your own GI Joe team with Sgt. Slaughter and the white Articulated Icons ninja, they're not going to look like they belong together. If you buy the Raptor skin for your character in the game, it includes the Raptor Satchel "Back Bling," Fortnite's what-even-is-the-point name for a backpack. 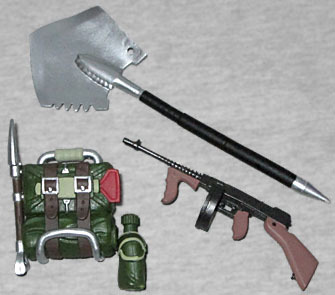 Suitably, the toy includes that same piece: it's an olive drab parachute pack on a silver frame, with wide brown belts holding it closed, a canteen on the right side, and an entrenching tool on the left. It can plug into his back and looks nice in place. His ranged weapon is the Drum Gun, inspired by a real-world Tommy gun, and his melee weapon is the Ice Breaker, a large, black-handled shovel with saw teeth along one edge. It certainly looks threatening, but it feels redundant with the backpack's e-tool. McToys spent decades on the wrong side of the articulation equation, but they're really trying to make up for it with Fortnite. This figure has a balljointed head and neck, balljointed and swivel/hinge shoulders, swivel biceps, double-hinged elbows, Revoltech-style swivel/hinge/swivel wrists, a balljointed chest, a balljointed waist, swivel/hinge hips, swivel thighs, double-hinged knees, Revoltech ankles, and hinged toes. The thigh swivels don't move too well, thanks to the shape of the legs, but that's the only complaint. Raptor can do pretty much whatever you'd want him to. The Cuddle Team Leader is probably the closest thing Fortnite has to a mascot. [uh, "Loot Llama," anyone? --ed.] Fine, closest thing Fortnite has to a main star character. The point is, Raptor may not be as iconic as the last figure we reviewed, but he's made just as well.